Calista Leah Liew: GAC Adventure, please change your website! For my 25th birthday, I really wanted to do something different. 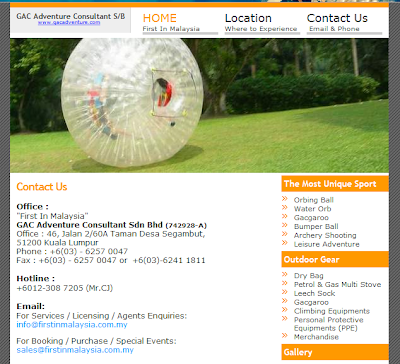 I'd heard of zorbing (orbing) and it sounded like something I'd really be able to enjoy, so I looked it up online, and found one company who does it in Malaysia. Their website looked promising, so Adrian, Oliver and I started to get excited. We decided we'd do water orbing and orbing downhill. I tried to call their office number a few times, but it went into fax. Nevermind, I thought. 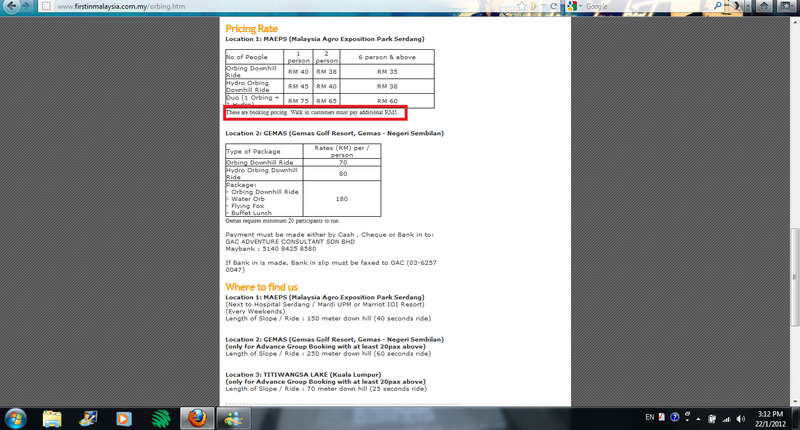 On their website it says walk-ins only have to pay RM5 extra, so I guess we'll do that. We set out at noon on Saturday, a day after my birthday, as it was stated that the activities were only available on the weekends. From Kelana Jaya, we made our way to Serdang, where the stupid Nokia GPS took us in circles while in search for Hospital Serdang, which is supposed to be beside MAEPS. We ended up at UPM, where the guard gave us directions. And we finally found it. MAEPS is a big place, so we couldnt find the GAC Adventure site. After asking about 5 different people (4 who were security guards), it was determined that NO one knew where this place was! So Oli suggested trying to call the office again. To our surprise, we got an answer! Lol.. Unfortunately, this seemingly good news dashed our hopes within seconds, as we were told that the orbing is only available for advance booking, and their staff were all out of the premises. He could however, slot us in for some time after February. Great. I drove around in the hot sun for over 2 hours, and you're telling me that you havent changed your website, so I'm here for nothing? A second phone call also determined that GAC was no longer available at Titiwangsa either. Obviously we were upset. I wasnt rude, but I'm sure he heard that I was extremely unhappy on the phone. The company's saving grace is only the fact that the guy who answered, a Mr CJ I think, was amazingly polite, and tried to be helpful. Unfortunately, his help was not of any help to us as I am now back in KK, and unlikely to ever try to go to GAC again. It kinda ruined my whole birthday, as I planned everything around the orbing. So anyway. It's just a little complaint that I felt I had to write about to release my upset. Looking back at the website, maybe I should've noticed that there was also a mobile number I could've called, but still. 1. Any companies that have websites, please update it as often as you have any changes to your company policies. Misleading websites are annoying and inconvenient. They also render your website quite useless. 2. Please get an office phone, and an office fax. You waste a customer's time and money by having a number that goes into fax if your staff do not answer on the 3rd/5th (etc) ring. This will also cause you to lose potential customers. Having an office phone+fax plus an extra fax number doesnt make any sense to me either. 3. Have proper signboards to your location. When the security guards of MAEPS dont even know where your company (which is supposed to be on the grounds) is, there's something wrong. We spent about half an hour driving up and down looking for the place, and I still dont know where it is. 4. Employ staff like the aforementioned CJ. Polite and helpful staff may save your company from being ripped to pieces by unhappy customers. I cant imagine what I would've done if someone rude had come on the phone. Hot+disappointed=angry+irrartional. Lol! So that's all I've got to say. Anyone else had good/bad experiences with this company? Or has anyone else been zorbing anywhere else before? Do let me know! PS: Will be uploading a post of the HAPPY parts of my birthday next! Whee..!! 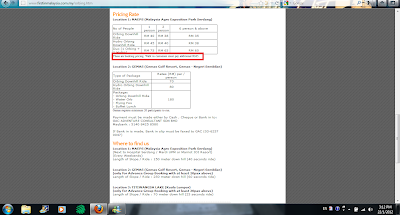 Yea~ I hate those website which mislead people, it's just inconvenient. That's so beautiful, you have taken the time to work out a business plan for them, if you send them the plan along with an invoice for your consultancy fee that should square things up. Don't get upset get even - I think that's been in a film somewhere. A.B. Haha.. I know right? It's like, why even bother paying for the domain la? Waste money only.. Lol..
Do you like those Do and Don't lists that some organisations lose/use? One DO would be to make sure that someone who is a promotional model is able to use our services on her birthday. A DON'T might be to have such a bad website that a promotional model, who would have been able to promote our business widely, misses out on our services on her birthday. What about the headline "Promotional Model disappointed at lack of enthusiasm in business community." I am a loopy kind of genius aren't I? A.B.